Jacob Estey’s (1814–1890) is the archetypal American story: a runaway from a poor family who, through ingenuity and perseverance, became a business leader and philanthropist recognized and respected throughout the world. Estey began his working life as a plumber’s apprentice at the age of 17 and, before the age of 35, was a partner in plumbing, lumber, slate, and marble businesses. Sensing a business opportunity, Estey took over a share of a small melodeon business in 1852. In 1855, Jacob Estey and partner H. P. Green took over the company and manufactured what was marketed as the Perfect Melodeon. 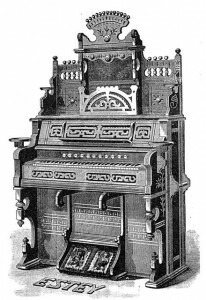 Jacob Estey became sole owner of the business in 1863, and introduced a line of Cottage Organs for homes and smaller churches. Through innovations in design, manufacturing, and marketing, Jacob Estey’s company continued to grow. 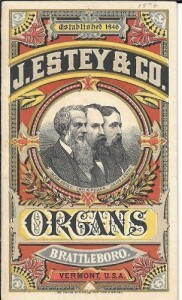 By his death in 1890, the company had manufactured over 200,000 organs. Jacob Estey was recognized not only for business acumen but his commitment to the town of Brattleboro. Estey represented Brattleboro in the Vermont General Assembly and Windham County in the State Senate, and was a founder and supporter of the First Baptist Church of Brattleboro. Among his philanthropic gifts, Jacob Estey was a benefactor of Shaw University in Raleigh, North Carolina – underwriting the first building in the U.S. intended specifically for the higher education of black women. The life of Jacob Estey is well documented in Manufacturing the Muse by Dennis Waring.